Recently I’ve been playing a lot of Dance Fabulous on the N96. It’s such a fun dancing game to play (especially when we are dancing to our own tunes). Basically it’s similar to one of those dance dance revolution kinda games minus the arrows directions. The game allows a lot of user customization. Dancer gender, clothings, skin colour, facial expression are some of the settings we can do to suit our likings. One of the biggest customization that I like is that it allows us to use our own tunes! That means I can put in a slow Titanic-ish song into the game and my dancer will be doing slow motions too. As we progress through the game, new backgrounds, clothes and dance styles will be unlocked. The gameplay is simple, create random moves using the navipad so that the dancer will not do the same move again and again (that will not earn you points btw). Utilise the up, down, left, right and center directions fully to create special moves and gain gold stars that will warp you to a special challenge. Check out the video I recorded. What do you think of Dance Fabulous? Leave a comment and share with us. The N-gage application is finally made available to the N97 worldwide. Previously it was just for certain regions. Of course, someone posted the N-gage app online and I tried installing it and it worked BUT I could not connect to the arena probably it was because of the region difference. All those were history, as the N-gage app can now be downloaded from the official site itself! (and yes, we can go connect to the arena with this version[v1.30 built 1541]). No games came preinstalled with app so we have to do it by ourselves. As you can see in the screenshot above, I was in the midst of installing Spore and some other games. To get games, just download them from the games page on the site or the showroom tab in the N-gage application itself. Once installed, all the games will be listed in the games tab and you can access to any of them with just a simple tap. You can also view your account details and game history too. In order to submit your scores, chat with your friends and view new games, you have to connect to the Internet and it can be done by just accessing the options menu. Watch this video as I briefly talk about the app and some games. Get N-gage for your N97 here! Nokia has just added some new updates for the Nokia N97 and we can get them using the SW update app in Menu > Apps. # N97 C: Phone memory update. Nokia Messaging and N97 c: Phone memory update. WHERE’S THE N-GAGE APPLICATION? WHY IS IT NOT AVAILABLE FOR EVERYONE?! I then tried to download the application from N-gage website but they are still hosting the 1.2x version. What a dissapointment. Its an application to free space on the internal memory of the N97 (C: drive), optimising it for more user memory available for possible SW installation on this drive’. Anyways, for those of you who are using N97, go get the updates now! Dance Fabulous, the one of a kind dance party game is finally out on N-Gage! It’s a dancing game that lets you dance to your own songs. You can also create your own unique dance moves and boost your music experience to a totally new level! Connect this game to the network and beat your friends’ score points! You wont see it on the N-gage website for now, since it’s scheduled launch date is 11th June… but you can get this game now by accessing the “showroom” tab on the N-gage app on your Nokia phones. Just make sure you click on options > update now! Here’s the official trailer for Dance Fabulous. Check out this video too! It’s Rafe from AllAboutSymbian trying to beat my high score (spot my name Jason G at the high score chart on the left of the LCD) at the Dance Fabulous party, Monaco recently. Check out Dance Fabulous Official Site now! Will I buy Age of Empires 3 game on the N-Gage? 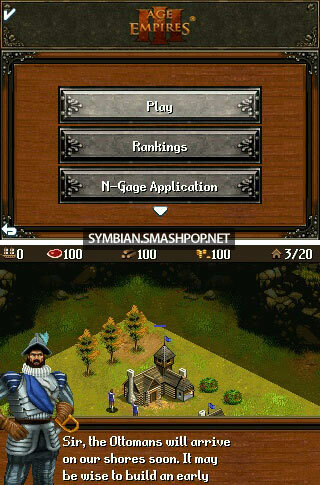 I installed AoE3 on the N96 last night and played around with the trial version. I had kinda low expectation of it since I played the Nintendo DS version and got disappointed as it did not resemble most of the gameplays as the PC version. Glu has done a great job with this one as it has everything we used to play on the PC; campaigns, skirmish and even multiplayer mode. WE can play the game in landscape mode but more functionality of the game can be accessed using the numpad. I started the game playing the first campaign which the objectives were to collect 200 wood, build a barrack and train 5 Pikemen. As far as I know, we cant really select the number of settlers or the armies as we wish. There are only 2 options; select one or double click to select all of the same type. Guess we need the mouse in order to be able to select, say… only 3 or 4 citizens… but that’s still fine knowing the restrains of the phone keypads. Gathering resources works the same as on PC. Plucking fruits for food, cutting trees for wood and mining for gold. Only if we have enough of these resources that we can construct new buildings. Fight scenes are a little too simple as we cannot really see the actions clearly due to the tiny screen, and there is no fighting sound effects during these actions. The experience would be richer if we can have sound effects for every actions in the game like mining, chopping trees and sword fighting. Watch the video I recorded below. Overall I think Age of Empires 3 on the N-Gage platform it not too bad and is worth buying. 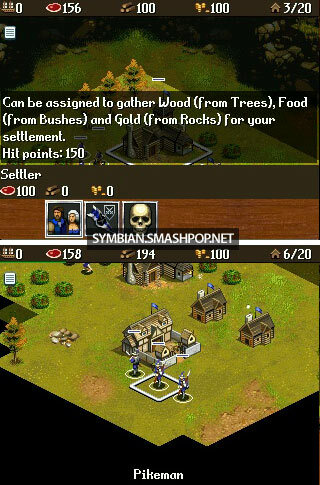 I will buy it because I used to be a big fan ot RTS games like AoE and CnC. Checkout Age of Empires 3 now on the N-Gage showroom. This is not fresh news but then I am sure a lot of us did not know about this. PocketGamer has come up with an N-Gage eZine(issue 01) that focuses on N-gage only content. In the magazine we get stuff like games info, games news, devices that supports N-gage, steps to downloading N-Gage etc etc. More screenshots below. The Digital magazine looks best on fullscreen IMHO. Click here to read it now! Asphalt 4 is out on N-Gage! Calling all Asphalt fans… it’s time again for you go visit the N-gage showroom cos Asphalt 4: Elite Racing is out for you to download! Face the world’s richest drivers in high-speed races through traffic or take on your friends in the exclusive multiplayer mode! Experience amazing 3D graphics and a unique feeling of speed. Choose from 28 licensed dream cars and bikes from the world’s most prestigious manufacturers, such as Ferrari and Bugatti, and zoom through the streets of Monte Carlo, New York, Shanghai, Paris, Dubai, and Beverly Hills to make your mark. Check your rides in your own garage and spend millions on fine tuning them. Take on the police in each city as they try to stop you with roadblocks and helicopters in order to seize your expensive toy. Can you become the ultimate VIP of urban racing? Click here and try Asphalt 4 Now! Crash Bandicoot Nitro Kart 3D is out on N-gage! After getting to know about this game since May, Crash Bandicoot is finally out! The game kinda reminds me of Mario Kart but with lousy graphics. Yes. I am actually quite dissapointed with the graphics as I have seen better looking N-gage games before this and I expected this to be the same. Gameplay is great. No lag…. although I keep getting the same power-ups(missile, oil and shield) oh yeah in this game you get power-ups to help you attack other players or to speed up. Anyhow, I would recommend you to go download the trial and only buy it if you think it’s worth yea. Download it here at Crash Bandicoot Nitro Kard 3D page. Resident Evil Degeneration is Out in N-gage! Yes! It’s out!.. but it has not been made available on the N-gage website yet. The only way to download the game is through the N-gage app on your phone. Go and view the showroom and you will get to see the Resident Evil game. Watch this video of the game. I’ve actually gone through the hassle the download the file off the app and you now can click on the download button below to get the exe file. Metal Gear Solid Is Out on N-gage! Metal Gear Solid is finally out on N-gage! MGS Mobile includes never-before-seen dramatic 3D graphics and it utilises the phone camera too. The superb graphics draws the player into the world of Metal Gear Solid and pushes the capabilities of the mobile platform. As you can see the game will initiate your phone camera. I’ll end this post here as I wanna try out MGS now… make sure you guys install it on your N-gage ya! Get it here. Hooray for N78 and 6210 Navigator users as Nokia has extended the compatibility of N-gage platform to these 2 devices. Now more people can play games like Reset Generation, System Rush, ONE, Star Wars: The Force Unleashed.. and many more! Click these 2 buttons below if you have any one of the 2 mentioned devices. Alternatively, you can point your phone browser to n-gage.mobi/d and select your phone model from the list. N-gage to be optimized for touchscreen! Photo above is not real ok… ahah just did it to support this post. Anyway… Jaakko Kaidesoja, head of Nokia’s gaming operations told Reuters in an interview that Nokia is working on a touchscreen support for N-gage and will roll out the optimized N-gage client early next year. Other than that, he also said that the firm will take 1 month to consider whether or not to expand N-gage to the Nokia N73 since it has limited computing power… but if it works out, N-gage will be able to cover more of the user base since Nokia has sold 20 million of it, making it the world’s most sold smartphone. Now that we are done with that…. let me ask you a question. “Are you an N-gage player yet? If not, go and create a player name, install the N-gage client and get yourselves some games to play! While you are at it, add me too.. my player name is “smashpop”…. currently playing Reset Generation and ONE. Continuing from my previous post, this would be my opinion and thoughts on the gameplay of Star Wars. The main character in this game, (that guy that you are controlling) moves by himself. All we need to do is to defend him and also make him fight. Haha.. sounds easy.. but its actually not. The game uses a so called new technology for players to interact with the character in it called Cellweaver. Cellweaver basically means users perform different keypresses in order for the game character to perform different tricks. The keypresses revolves in the 9 grid positions, up, down, left, right, top left, top right, bottom left, bottom right and center. This can be achived by either using the keypad, or the navigation pad. Some of the attack forces are Grip, Push, Pull and Lightning. You will also eventually learn some defence forces like Heal, Protect and Speed. Here’s a video to show you how exiciting the game is… also listen to music and sound effect yea. Hi all, I have been filling up my free time with a lot of light saber action these few days and I have finally completed the new Star Wars game on the N-gage. Woot! Ok let me tell you about the interface and graphics in today’s post. The menu has a few layers… starting off with Play, Journal, Ranking, Help, Options, N-gage, About and Exit. Each option branches to sublayers and that again, branch to another sub sub layer. Graphics & audio wise, I rate it 9.5/10. Reset Generation now on N-gage and PC! The most anticipated N-gage game of the year has been released! Reset Generation is the first cross-platform game whereby users can play it in their N-gage enabled devices as well as on the PC! The game is most likely to appeal more to those whom has been playing those old school game on cartridges and blowing up walls using bombs or saving princess at the end of the games they played. The gameplay is similar to Bomberman but this one has a lot more other features and the producers has actually put in elements of many games in it. Play it and you might spot some familiar looking characters in it, eg: hedgehog, plumbers, princess, bomber etc. Are you on N-gage yet? Cos if you not, better make your way now to N-gage.com and get yourself a free installer and dont forget to register a username! Currently only 5 models are supported, Nokia N81, N95 8gb, N95, N82 and N81 8gb. So if ur using one of these, you are damn lucky. Once you have installed and registered a player name, add me! I’m currently enjoying my N-gage experience with the game Hooked On: Creatures of the Deep. I will be writing a review on this soon.. but for now you guys can watch the trailer first.